A programme that celebrates live energy by the bodies presence, the importance of gesture and the relationship to matter. In a focused attentiveness or in a letting go, you will find noisy images, sounds that give rise to images and objects that give rise to sounds, devices hijacking, explorations of the space with variable configuration, waves in interaction. Scott Fitzpatrick is a visual artist (Libra) from Winnipeg whose film and video work has screened at underground festivals and marginalized venues worldwide. He obtained his bachelor’s degree in Film Studies at the University of Manitoba and began conducting lo-fi moving image experiments in 2010. Recently his short films have received prizes from the WNDX Festival of Moving Image, Milwaukee Underground Film Festival, Onion City Experimental Film & Video Festival, and Festival du Nouveau Cinema, and was the most recent recipient of the Winnipeg Film Group’s Manitoba Film Hothouse Award. In addition to producing his own work, Scott Fitzpatrick presents the work of others through the Winnipeg Underground Film Festival and Open City Cinema. 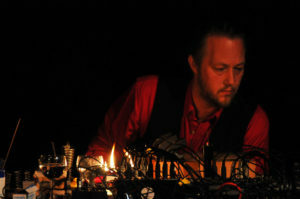 Sound recording as a form of training for the ears, he performs live with a selection of amplified devices and processes. From rock chalk to springs, from burning nuts to vibrating metal, he plays with objects otherwise considered mute. Based in Prestwich, Manchester, UK., he works internationally and has featured on UK TV, BBC Radios 3, 4 and 6, Resonance FM and on radio stations worldwide. Patterson uses sound making and recording to devise performances with a selection of amplified objects, devices and processes, from rock chalk to springs, from burning nuts to vibrating metal. 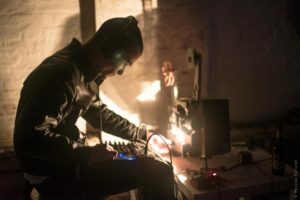 Lee Patterson will talk about the dual but interrelated elements of his practice, exploring how his field recording work with hydrophones and contact microphones co-exists and has co-evolved with his live work. With recorded examples (underwater sounds and vibrations within solids) alongside demonstrations of his unique, self built instruments, he will show how, given current technological possibilities, notions of studio and landscape are interchangeable and thus, how open ears, play and curiosity can deliver new perspectives on work and environment. 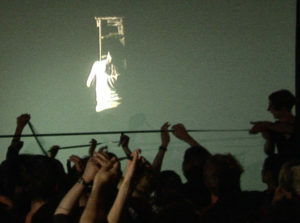 This 100ft length of film is formed by the audience into a ‘living loop’, before being taken up and played out by the projector creating a sympathetic film which conjoins the audience and the artist in an act of duration and suspension. 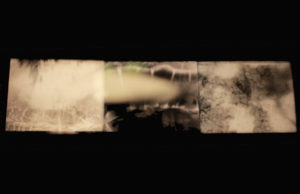 Bea Haut is an artist who works primarily with 16mm film. Manifesting as sculpture, installations and projections her works allude to perceptions of inter-related moments, spaces, and actions in between. During the 90s she worked with Loophole Cinema, and recently has been producing Analogue Recurring, a 16mm screening event in London, creating an informal space for experimenting with projected film, exposing and developing ideas surrounding it’s materiality. She is a co-founder of Film in Process which is an artist-run service for B&W 16mm processing in London and the UK, as well as teaching workshops in DIY processing and printing. Lichun Tseng is an artist and filmmaker from Taiwan who lives in Netherland. In her work, she’s interested in searching for the experience of the vital dimensions of life, absorbing and partaking in it, grasping its wholeness; in which exploration and reflective contemplation are profound mental drives. She has explored this research and practice mainly through 16mm film, installation, performance, and painting. She is one of the members of an artist run lab, Filmwerkplaats, Rotterdam, Netherlands. Ji Youn Kang (Seoul, South Korea) is a composer and sound artist based in The Hague. She studied composition at Chu-Gye University of Arts in South Korea, before she moved to the Netherlands and achieved her master’s degrees both in Sonology at The Royal Conservatoire in The Hague and in Composition at Conservatorium van Amsterdam. Most of her music pieces have been composed based on the rites of Korean Shamanism, and many of them were written for Wave Field Synthesis playback, exploring the relationship between musical and physical spaces. At the same time she has been composing live electronic pieces for both traditional and non-traditional instruments, ranging from a solo instrument to a large orchestra, exploring mostly the primitive, empowering rhythmical elements and the noisy sound sources that the Korean ritual music involves. She is also active as a solo performer and is a teacher in Sonology at The Royal Conservatoire in The Hague. Her pieces have been performed in many different venues and festivals such as La Biennale di Venezia (IT), Gaudeamus Muziekweek (NL), Internationales Musikinstitut Darmstadt (IMD), Time of Music (FI), Sonic Acts (NL), STRP (NL), REWIRE(NL), SICMF( KR), Sonar (ES), Synthèse (FR), TodaysArts (NL), MISO (PT), Audiopolis (ES) and Festival de Música (ES). Exported from the Lyon underworld, Société Etrange is a trio fighting for electronic harmony. 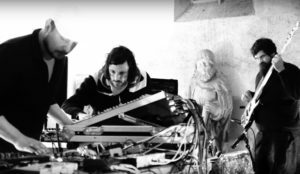 A continuous music, as minimal as inhabited, influenced by krautrock as well as dub. A sort of unpredictable encounter between Can, Throbbing Gristle and Jimmy Cliff. As if Raël would dabble in techno music.